With the American baby boom and a significant number of women joining the professional workforce in the 1950s, wealth grew and with it the need to keep up with a moving and growing society. The 1950s makeup cosmetic industry exploded with mega brand names elbowing out the smaller brands who started the business a few decades ago. 50s makeup reflected a change in attitude from the simple make do days of the 1940s to refined feminine beauty of the fifties. Everything seemed new in the 1950s. New cars, new appliances, new suburban homes, 1950s Style Clothing— all designed away from practical standards towards a sculpted femininity resembling that of the elegant Victorian era. Everything had style, including a woman’s makeup. While the 1940s embraced a natural, minimal makeup, the 1950s woman painted her face with new colors, exaggerated lines and a tweaked architecture. Instead of a woman choosing colors that complimented her skin and hair colors, she was now free to follow the trends and perfectly match her lips and eye shadow to her purse, hat, gloves, shoes, car, house, washing machine, etc. (I’m not kidding). A perfectly coordinated head to toe look was always the ideal, although not without debate. Many fashion magazines advised women to ignore all trends and choose makeup that accentuated her natural beauty. Men agreed, preferring the post-war simple beauty to that of the new sculpted faces. Putting on makeup wasn’t just about attracting a husband, but keeping herself as his eye candy after marriage, too. Women who worked outside the home were the biggest consumers of 1950s makeup who followed the latest trends and colors more than teens and housewives. Middle class country and suburban women rarely kept up with makeup trends, instead using minimal makeup applied in a natural fashion. The true painted faces of the 1950s belonged to upper and middle class city women. Natural 1950s makeup guide: pin it, print it, share it. For this tutorial, we are focusing on what real women wore on a day to day fashion. There are plenty of other 1950s makeup tutorials online that focus on heavier Hollywood, Pinup or Rockabilly ’50s looks. They certainly have their place in history, but for 99% of women, this is the makeup they wore. Foundation & Powder: One shade darker than skin tone with a slightly pink tint. Rouge: Light pink cream rouge if you can find it. if you can’t. Eyeliner: Brown or black for day wear. Colors to match your eye shadow if you want to be trendy. Eyeshadoww: Shades that coordinate with your eye color for most looks. Brighter shades to match your dress or accessories. Mascara: Cake mascara will give you the most authentic look. Brush mascara for a “thick” look is second best. Lipstick: Red, pinks, coral, and orange tints in a matte finish. One shade lighter for day wear and darker for evening. For authenticity, the only makeup line I can recommend is Vintage makeup is recreated in beautiful tube, compacts and tins. They are also one of few places I know where you can still buy cake mascara! Each product comes with the date it was first introduced. They have two delightful lipsticks, 1955 Exotic Pink and 1959 Red Hot, which are perfect for the 1950s. For over the counter makeup, I personally use L’Oreal, Revlon and Bare Minerals. The brand is less important than the color and matte finish. vintage reproduction 1950s makeup. Highly recommended! A pretty face begins with an empty pallet. After night cream is washed off, a layer of foundation cream is rubbed in to match the skin or a little bit darker. After the foundation is on, use cream rouge (not powder) applied in dots all over the face. Blend it all in so that your skin is now a pale pink (even if you have very dark skin a glow of pink is very important). Add a little contouring by creating another layer of rouge on the forehead and just a tiny dab on the nose. Rosy red checks were out of fashion in the 1950s. If any rouge was used, it was for contouring the cheekbones. Apply a little creme rouge on the upper cheekbones and brush upwards to the temple, blending as you go. This high rouge application gives the face an overall lift. If you have naturally defined cheekbones you do not need this step. For round or pear shaped faces, the rouge is applied a little lower and further out towards the ears. Choosing a rouge color is best by trial and error. If you are going to be under artificial lights, you may want to use a lighter shade since artificial lights tend to darken makeup. A powder rouge should be applied after a dusting of face powder (next step), only if needed to bring out a touch more color. The ideal rouge is one that adds a healthy glow to the skin, not to have a painted face. Consider powdering your neck, shoulders and chest, too, if exposed with a low neck evening gown. Eye shadow in the early ’40s was seen as a subtle shadow not a color statement. Women were encouraged to keep its use light and natural. This all changed by the mid 1950s when women were wearing colorful eye shadows that matched their couches, curtains, shoes, and handbags. Popular colors were dusty purple, violet, ice blue, silver, light or dark green, teal, and gold. For daywear, matching shadow to eye color was the most common. For evening, a tint of silver for light eyes and gold for darker eyes was more elegant. Eye shadow came in powder form but also liquid or creme, which went on smoother and controlled the line. Eleanor Arnett of Beauty is Not an Age (1955) says, “Do be careful about your eye shadow. That, again, can make you seem exhausted unless skillfully applied. This you do lightly, apply to the lower part of the upper eye lid only, unless you’re really young and can afford to look tricky.” Others disagreed and suggested shadow fade up to the brow line. As the decade progressed the recommended amount of eye shadow grew with each year. To apply, rub shadow with your finger onto the lower lid about 1/8 inch and only slightly past the outside edge. Use your pinky finger for the edges. If you have small eyes, extend the shadow out past your crease another 1/8 inch. For deep set eyes, eye shadow will be hardly noticeable on the lower lid, so use more on the upper lid. A light application of Vaseline was recommended instead of eye shadow during the day or for teens. In the mid 1950s, the mandarin eyebrow trend removed the natural brow tips and drew back in the brow with an upward sweep much like the wing effect with eye liner. No two brows were ever perfectly symmetrical, and that was part of the charm of a 1950s painted face. For women who didn’t want to use an eye brow pencil or were going for a more natural look simply shaping the brows in their natural best was recommended. One tip suggested brushing brows with a little bit of soap to keep them groomed and a bit darker than dry brows. Vaseline or olive oil also work instead of soap. The doe eyed wing tip look started in the late 1940s but really made a statement in the 1950s. To create the look, start with eyeliner in the middle of the lid and extend it to the outer edge plus a smidge. The end of the line should angle up slightly and then back fill to the starting point to create a slight triangle. By the mid 1950s, the doe eye turned into the cat eye with a longer, thinner, extended line to the edge of the eye socket. The starting line also moved to the inner eye corner instead of the middle. There were hundreds of variations of cat eyes, from the length or thickness of the line, to the shape and length of the flip at the end. Color was even a factor. Black was recommended for black or dark brown haired ladies, while brown eyeliner was better for blonds and redheads. Eyeliner could be worn on the bottom lid but usually not. An eyelash curler was not new to the 1950s, but Kurlash improved the design with a cushion on the crimpers. Now women could curl with comfort. A light curl was an ideal first step to creating beautiful ’50s eyes. Eye lashes were then topped with mascara (cake mascara, the mascara wand wasn’t invented until the very late ’50s) in the same color as the eye liner. In the mid ’50s many mascaras matched the eye shadows: blue, violet, dark green or brown for light eyes and black for dark eyes. To apply cake mascara damped the cake brush with just a little tap on the mascara pad. Apply to the underneath of the upper lashes by placing the brushes bristle down and dragged upward on the lashes. Let dry and repeat. The application should be thick but not clumpy. Only if necessary on very light colored eye lashes or small set eyes was mascara applied lightly to the lower lashes as well. This was usually just an evening addition. 1950s Lipstick colors and lip shapes. Lipstick colors were all over the place in the 1950s. Red was still very popular but so were lighter, innocent shades of coral, pink and orange. A woman had a new shade for every season and time of day. Natural lip shapes of the 1950s followed those of the 1940s but thinned out somewhat. Lips were simply colored to their natural shape, using softer colors. If overdrawing was done, it was to reduce the peaks to a smaller valley and rounder shape that extended out to the corners of the lips. This added fullness all around rather than just at the top or bottom, like in the 1940s. The thickness of the top and bottom line were usually equal. To apply lipstick first use a lip brush to drawn the outline, then fill in with lipstick. Press lips together for one minute. Wait a few minutes then blot the extra off with a tissue. Apply a light powder for all day staying power and top again with lipstick for a little gloss. 1950s lipstick was still a matte finish. Glossy finishes were not in style yet. Looking for a lipstick that will wear all day? The pinup survey says these brands are the best: Kat Von D, Lime Crime, Lipsense, LA Splash, Madeline 24 hour, Stila, L’Oreal Infallible, NYX suede, Julie Hewett and Besame. by Lauren Rennells is a great book to have on hand. The looks are a bit more movie star than daywear, but the modern techniques are still helpful. also has some additional tips and history. – These original beauty books from the 1950s is the one resource I highly recommend when you are ready to take your makeup application to the next level. The book covers more details about choosing colors, application tips and tools, and my favorite — how to apply foundation and rouge for my specific face shape. After following all the directions in this book I was able to create an even better 1950s look with makeup, specific for my face shape, skin type and coloring. This is why going to a direct source from the 1950s is MUCH BETTER than any “inspired” makeup lesson can achieve. Only $9.99 as a digital download. 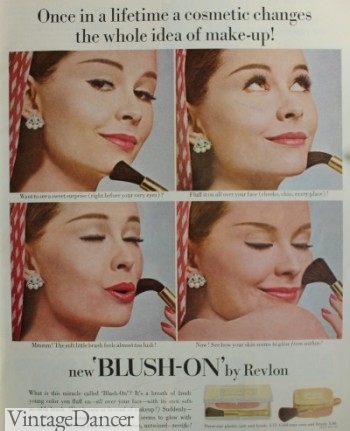 1960s makeup guide and beauty products- move onto the next decade in beauty history. У нашей организации нужный интернет-сайт со статьями про https://kompozit.ua.